While the main framework of the software remains the same across both the versions there are a few improvements here and there. 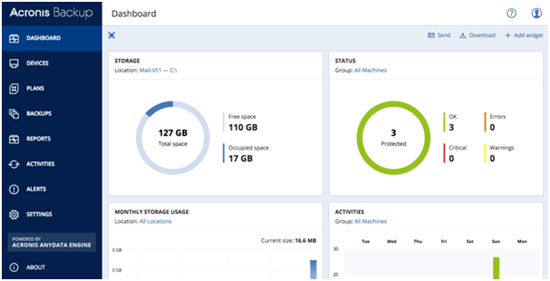 Acronis Backup 12.5 Server Advanced version obviously has more features than the Standard one. However, the Standard version is one of the best backup and recovery software available in the market in of itself. The protection from data theft and ransom ware threats provided by Acronis is one of a kind and is extremely useful now with the sudden increase in cyber crimes. Moreover an easy backup and recovery ensures it is a hit with customers across different generations. The fast and reliable recovery is an added bonus aside from the fact that it lets you backup or recovers entire data or just a selected few. The range of total control provided by the Acronis Standard Backup is second to none. The Advanced version comes with a few tweaks and a few more handy additions like remote installation, tape support, centralized backup for multiple machines and even backup or restoration of remote data. The uses of such advanced features may not be apparent but once you get the hang of the software you will start to like what it has to offer. The recovery time in the advanced and standard versions are roughly the same and both are adept at what they are actually meant to do. Both the standard and advanced version will serve you well and suit your purpose without a snag. However if you are a working professional or you want this for a large and remote system then we suggest you go for the Advanced version. Furthermore the Active Protection that comes with the advanced version is a boon for any computer owner and offers the most reliable counter measures to ransom ware and cyber attacks. However, the Standard version is suitable for general users looking for great backup software worth their money. The Advanced version offers a lot more at first glance but do not underestimate the Standard version. Both the versions are created to accomplish their primary functions without any glitch and the extra features in the advanced version are technical changes which may only be important for advanced users. If your primary need is to safely backup and restore personal data then you can certainly do without the advanced features. Then again the data protection feature that comes with the advanced version is something you wouldn't want to let go because of a few extra dollars. The usefulness of this feature is paramount and needless to say a necessary these days if you want to protect sensitive data. So be aware of your needs and know what features will be useful to you before you decide between the standard and advanced versions. Either way I can assure you that you will not regret your decision. - The price is high. The price may be a factor for some of you but as you can see even with the high price, the pros far outweigh the cons.